Universal Controls 2016.1 build 303 has been released and is now available for download. This version adds a beta of our Docking/MDI product, making it possible to include docking tool windows and/or a multiple-document interface in your apps for Universal Windows apps. SyntaxEditor also includes two new Metro-themed image sets that can be used. The Docking/MDI beta included in this version includes nearly all the docking window functionality found in the WPF version of our Docking/MDI controls. Be sure to check it out and let us know what you think. See the announcement post for the detailed list of enhancements and updates in this build. Do you want to chat with us about what we're working on next? Register to join our Slack team and help guide our future development efforts! Anyone who has worked with the native WPF TreeView knows that its API is difficult to use (compared to the WinForms TreeView) and the performance isn't very good when binding to large large data sets. What are the top 5 built-in features you would like to see implemented in a TreeView? What specific pain points have you encountered with the native WPF TreeView? What features/API would help resolve those pain points? Any other features/functionality you think we should consider? Please either write our support address with your feedback or join our Slack discussion on the topic and chat right with us. The benefit of the chat option is that you can see what others are saying and throw in your two cents as well. WPF Controls 2016.1 build 631 has been released and is now available for download. This build contains numerous minor features, updates, and bug fixes across the various WPF control product range. It is highly recommended that v2016.1 customers upgrade to this build since it fixes all issues that have been discovered in the major Docking/MDI control updates that were part of the first 2016.1 release. The first 2016.1 release added new Metro themes that have accent colors, like in the screenshot below. The QAT buttons on the upper left of the window were originally wider in Office 2016, matching the width of the system minimize, maximize, and close title bar buttons. However in the most recent Office 2016 update, the QAT button width was reduced and we've updated their size in this build to match. We now offer a way to provide real-time communication between you and our development team, via the free Slack messaging app. The app can be accessed directly in a web browser (https://actipro.slack.com/) or via Slack's excellent desktop and mobile apps. The purpose of chat offering is to facilitate interaction with our development team, so that we can collaborate together on new product feature ideas, show screenshots of work-in-progress, and even provide access to preview builds of new features. This is all designed to allow you to play a larger part in steering our future work. We currently have Slack channels related to our UI controls, the Code Writer app, and a general tech discussion. Please note that the Slack channels aren't for technical support or sales-related questions. Use existing support/sales mechanisms for those. Since Slack is geared around private team chats, you must be added to our Actipro team before you can join in the discussion. All you have to do is click the Request to Join button on our development team chat page and email us the requested info. We'll add you to our Slack team and you'll receive an invitation in your e-mail. Whether you are already a licensed customer of our UI controls, just evaluating them, or are a Code Writer user, we'd love to have you get involved in the discussion. Many of you are aware that we created a free text and code app named Code Writer that is found in the Windows Store. 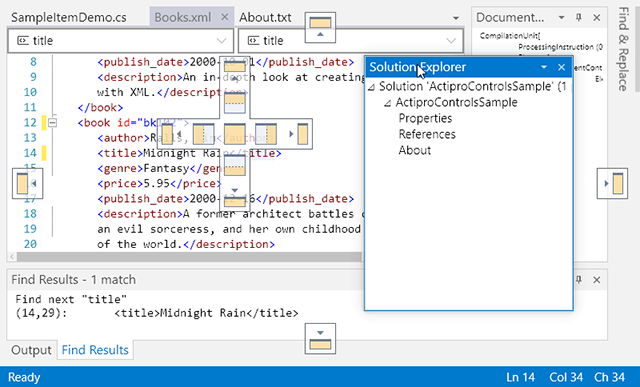 It is an excellent tech demo of our commercial SyntaxEditor code editor control (available for all Microsoft UI platforms) and makes a great replacement for Notepad. We're pleased to announce that we've just created a dedicated @CodeWriterApp Twitter account for the Code Writer app, making it easier to stay on top of the latest app news. Click the View button above to access the app's Twitter feed and be sure to Follow it! A bit of history about the app... Code Writer was one of the first high-quality Windows 8 apps in the Windows Store. Its user interface was originally optimized and designed for full screen usage, making use of app bars, etc. While the user interface is still clean and minimalistic, its current UI design needs rethinking for windowed usage in Windows 10. Even with a somewhat dated UI paradigm, the app is consistently rated well over 4 stars, which is a testament to the quality of the app. We have started working on a revamped UI design for a future Windows 10 version and would love to discuss it with you, our users. Please register to join our Slack team and join the #codewriter channel once added so we can throw around ideas for Code Writer v3.0.